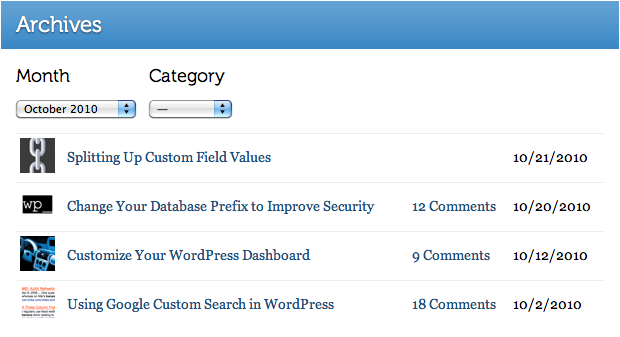 Note that the WordPress functions for the two dropdowns are a bit different. wp_get_archives requires you to bring your own select wrapper, which wp_dropdown_categories does not. For the former, you'll also need to include your own "no-choice" option. I'm sure the WordPress gang has their reasons for this kind of thing, but I'd prefer to see it standardized over time. If none of the variables are set, return a message telling the user to please select values. Output a table of the results, containing the post image, content, date, comments, etc. The #archive-pot is where we'll load in new markup as we get it. The wrapper is there because that way we can dynamically adjust the height and do it really nice and smoothly. Set height of wrapper to height of inside. Seems weird, but now that the wrapper has a static height and hidden overflow, it won't blast open when new content is added, we can animate it's heigh accordingly. Notice how the data that we POST is prefixed with "digwp_"? I had a little brainbender on this, while I was trying to POST data as like "m" and "month" and things like that. Apparently WordPress doesn't like that. It can 404 an otherwise perfectly good URL for you when you pass it parameters (GET or POST) in that format. Check it out: https://digwp.com/?m=2007&y=3849&cat=w34we. So anyway, using your own prefixed parameters will save you that headache. This is by no means limited to what we have done here. All were are doing it passing a getter file parameters that we want built into a query string. We could make checkboxes so you could pick multiple categories. We could include authors. We could include tags. The sky is the limit really. I just did it right on this site, so you can see our own archives. Superb trick Chris! Will use this for sure! Nice idea, I always like the live filtering. Information Architects used to have a search somewhat like Google instant that whittled down the archives results as you typed. Also, a great tip on prefixing post variables, I was hitting my head against the wall a while back trying to figure out why a simple contact form was failing…so, now everything gets a prefix. Also, is there a reason you’re using an intirely seperate template file and creating a page for the getter? Why not have it as a function in functions.php and use a template_redirect (or some other early hook)? Nice ! But, will be much great if you add this functionality too. If we select a month, say September and then we click the category drop down -> The categories which have no post in September should grey out and can’t be selected. This way, I can save a lot of time if there are no real posts in some of the categories in a particular month. I’m not sure why htmlentities is used here. Presumably becuase of the &ampersand in the querystring, but htmlentities makes & into &amp;, so not sure if that helps. You can use an array instead of a querystring to avoid this issue all together, in the same go saving wordpress from having to convert it. Cool. How to do it for post types and custom taxonomies? It’s just not something that makes much sense as a download. There is too many custom things you need to do that a set of downloaded files can’t do for you. However there it may be possible to pluginize this and I’ve looked at a few options, so we’ll see how that goes =) Glad you got it working. where does the dropdown code go in? trying it on my end, but doesnt seem to work. Nice tutorial. It took a while …. but I managed to set it up on one of my blogs. Thanks (+1 Stumble). This is great, Chris! Thanks for posting. I would love to see how this would work with custom post types/taxonomies. I also like the idea of if you select a month or post-type, to only show the categories or taxonomies in the dropdown that are available for the first selection. Not working. Can you please fix code as Jim said. There is something missing from your code in this tutorial. Ok, i find out how to make this to work, but now, when i select category from drop down, webpage goes to that category, but not loading archive page with list of articles from that category. I’m a noob here, and although I get most of the parts right, I’m just a WP freak and not a PHP programmer. The question: how do you assemble all the parts together so you can display the page properly? I also see that you don’t communicate much with your commenters, I don’t want to waste my time and your time here, so please just let me know if there’s something I don’t get right. Sergiu, i found out how to do this, but not reading original blog, but instead here. I’ still having problem from #15 comment. Hello there, and thank you for a great trick! I have made a little modification and use it on my photo albums, and instead of fetching several posts, it just fetches one post and displays the whole post. Or, at least that’s the thought. Since I’m fetching and displaying the whole post (a photo gallery) with the_content, not in rows as in your example, I would like to change the following function so that it checks how tall the post are, and then give the archive-wrapper that height. As it is now, it becomes 50 pixels high, and nothing else shows. I’ve tried experimenting with the overflow on #archive-wrapper, which works half way, the problem then is that my footer doesn’t get pushed down, and the content continues down under the page bottom. Hope there is a solution to this, I’m not much of a coder myself, and has come this far with trial, error and a bit of christmas luck perhaps. The archive pot height defines the height now I guess. Thanks again, if I remember I will post the result when I put the site up online! Grate tutorial Chris! Thanks for that. I am still working on it, trying to use check-boxes instead of drop-down. Do we have any chance to paginate the results of the dynamic content? If the result of the query is for example 60 posts, we’ll have a very, very long page, no? Many thanks. Hi, i have tried this tutorial and its work good, but when i click on a category, than all posts were displayed… i have no idea were the mistake is.